Ah, Bordeaux. There is no other place like it. It’s an area dripping with history (including our own Thomas Jefferson traversing its land), historic estates (some of the most beautiful wineries in the world), legendary producers (Lafite Rothchild, Chateau Margaux, Haut-Brion, and dozens more), and of course some of the best wines of the world. In the Bordeaux Masterclass, we will do a dual focus on the geography/terroir and the grape varieties. We will start with a historical discussion of the region (and a tip of the hat to the Dutch, for reasons we will explain). From there we’ll do a quick overview of White Bordeaux, discussing the balance between Sauvignon Blanc and Semillon. Then the big discussion begins on the reds of Bordeaux and the principal differences between the sub-regions. This detailed discussion will cover all your questions regarding what grapes are planted, where, why, and by whom. Our tasting will cover the geography of the region while we discuss why some Bordeaux are $15 a bottle and some are $1500 or more. And of course, we will taste incredible wines from across the region and covering all price points and several vintages. 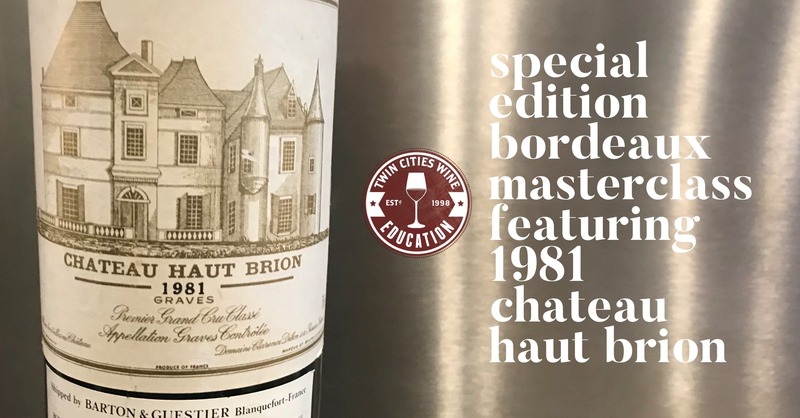 Special highlight of this class will be a tasting of the legendary Chateau Haut-Brion from the 1981 vintage. Bordeaux is intimidating for many. Walking into the Bordeaux section of a wine shop often brings up more questions than answers. Why are so many labeled “Grand Cru Classe”? Why are some dominantly Merlot instead of Cabernet Sauvignon? In this era of better winemaking, does vintage matter as much as it used to? We will explore all of these questions and many more in this most comprehensive of wine classes. Come prepared to shift your thinking on this very traditional, rarely changing land.